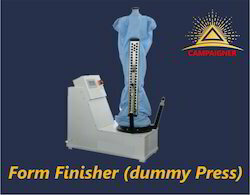 Form finisher ideal for pressing shirts, jackets, coats etc in bulk. Saves on labour, power and economical. Dress Form Finisher. Pneumatically Operated. Steam Heated. A necessity / must for every laundry as removing stains before washing is the most important process to keep the linen clean. Ø The model can be rotated left or right freely, easy operation. Ø With strong steam ejection device and function to adjust the strength. 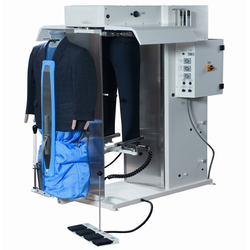 Form finisher steam body former for both washed and dry-cleaned shirts, anoraks and jackets, without boiler. To be connected to a steam and compressed air supply. It is a Form Finishers / Legger for Denim Jeans/ Cotton Trousers. for Mens / Ladies / Kids bottoms. It is available in different waist sizes with different functions. It is strong and sturdy machines with low maintenance cost. We are devoted towards offering the qualitative range of Fabcare Form Finisher as per client’s precise need and requirements.